Comfort foods during weight loss are great, they help invigorate me, motivate me, and remind me that losing weight isn’t about sacrificing delicious food, but rather enjoying foods as part of a complEAT lifestyle. This classic dish, perfect for the whole family, is easily incorporated into a healthy diet. It has a good balance of macro nutrients, and is packed full of vitamins and minerals. The order of operations is crucial. I have tried many permutations, and the following order is ideal. Finely dice your onion, and mince your garlic. Chop your fresh herbs, and crush for maximum flavoring. Add the onions and salt, sweat the onions and do not let them brown. When the onions begin to turn translucent, add the garlic, and pepper. When the garlic is nearly at peak aromaticity (before it takes on a roasted fragrance), add the wine. Just as the alcohol dissipates, add the canned tomatoes. As the sauce begins to bubble, add the fresh herbs. Cook only until the herbs become very fragrant, and serve. *I cook this sauce by smell, when done right, this simple sauce will be one of the most fragrant dishes you have ever made. Place the onion, garlic, and tomato in a food processor and pulse until coarsely chopped. Add the herbs, and pulse until chopped, and thoroughly mixed. Crack the egg into a bowl, and break the yolk. Add the onion herb mixture, the beef, and panko bread crumbs, and mix everything together. Mix until the panko is completely incorporated, but not so long to make the meatballs tough. Put on a pair of gloves, and form small once inch balls. 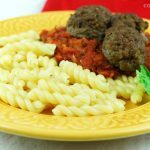 Place each ball on a parchment lined baking sheet, with about 2 inches between each meat ball. I can generally fit about 12 meatballs per pan.